You must make reservations at least 5 minutes in advance of the time at Queen Mary Tea Room. 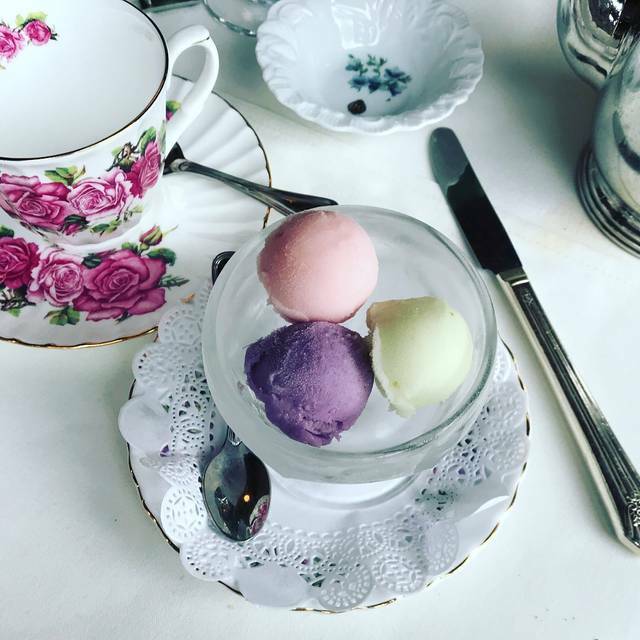 Treasured memories are made at Seattle"s Queen Mary Tea Room, where exquisite teas, delicious meals, and mouthwatering desserts are savored. Once inside, guests are intimately surrounded by Victorian elegance. The ambiance is accented with English bone china, delicate lace, and rich wainscoting. 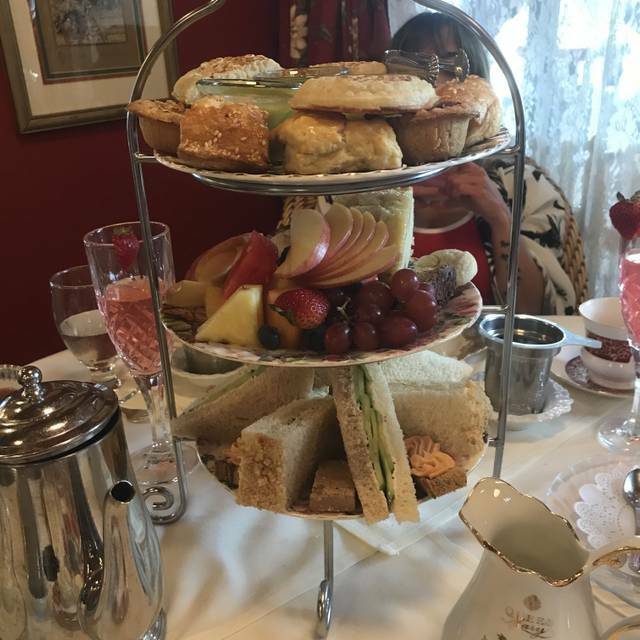 There are generous helpings of authentic British cuisine, the solace of good friends, the warmth of beautiful full leaf teas from around the world, and shelter from that occasional Seattle rain shower. 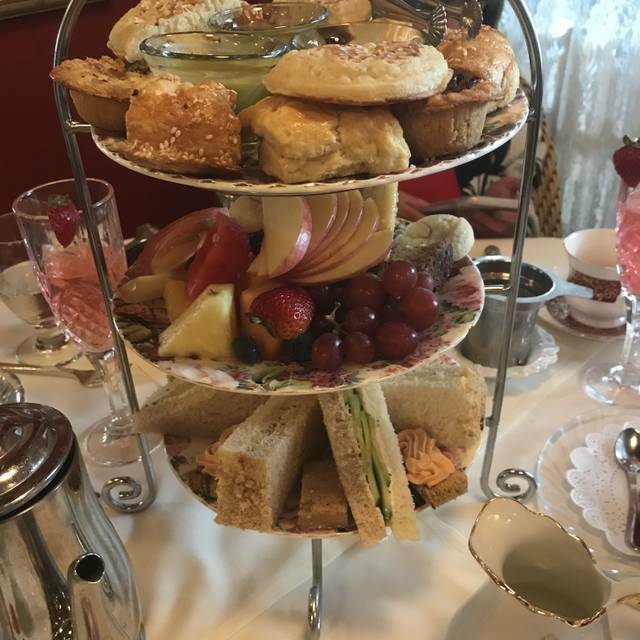 Queen Mary Tea is the destination for so many occasions; birthdays, baby showers, or just a place to take someone for something special. Broccoli, mushroom, onion, zucchini and three types of white cheese with a dash of red, orange and yellow peppers. Served with fresh fruit and a green salad. Chèvre cheese, fresh basil, marinated artichoke hearts, scallions, pickled asparagus, spinach and q.m. Smoked salMon. Served with fresh fruit and a green salad. Bacon, leeks, cremini mushrooms, yukon gold potatoes and swiss cheese. Served with fresh fruit and a green salad. Phyllo dough crust surrounds layers of ham, spinach, egg, onion, tomato, plus layers of assorted white cheeses. Served with a side of fresh fruit and a green salad. Beef and lamb kidneys with a red wine sauce in a puff pastry shell. Served with an organic green salad. Ground lamb, celery, carrots, red peppers, onions and brown gravy, topped with mashed potatoes. Served with an organic green salad. Chicken breast, peas, carrots, onions and puréed red pepper in a puff pastry shell. Served with an organic green salad. Puff pastry filled with cubes of beef, potatoes, carrots, celery, peas, leeks and onion. Served with soup and an organic green salad. Three puff pastry crescents filled with curried beef. Served with homemade soup and fruit. Grilled with a spread of chèvre cheese, hazelnuts and fuji apples. Served with a cup of soup and fruit. Caraway bread with a pumpernickel swirl, tomato, onion, mushroom, zucchini, walnut pesto, munster and provolone cheeses. Served with fresh fruit and salad. Shredded chicken breast tossed with celery, scallions, grapes, raisins and a honey mustard dressing atop mixed organic greens. Garnished with almonds and served with a whole wheat roll. It was cute, quaint, and just simply lovely! 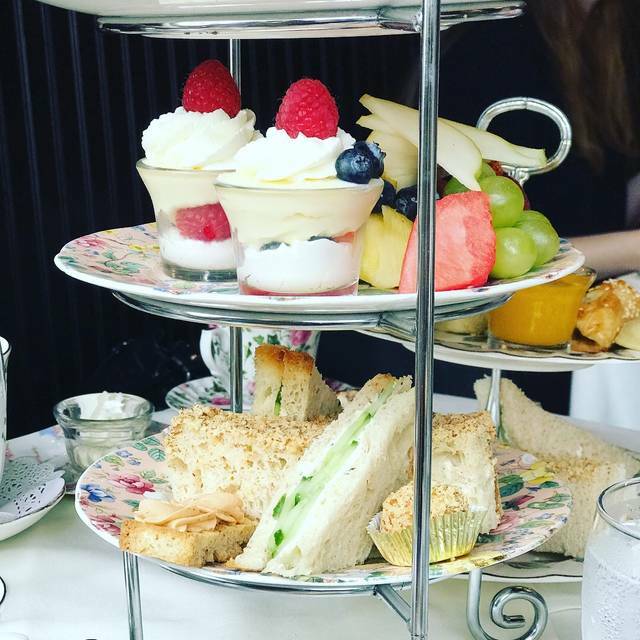 The Queen Mary Tea Room is a fun and wonderfully British outing. 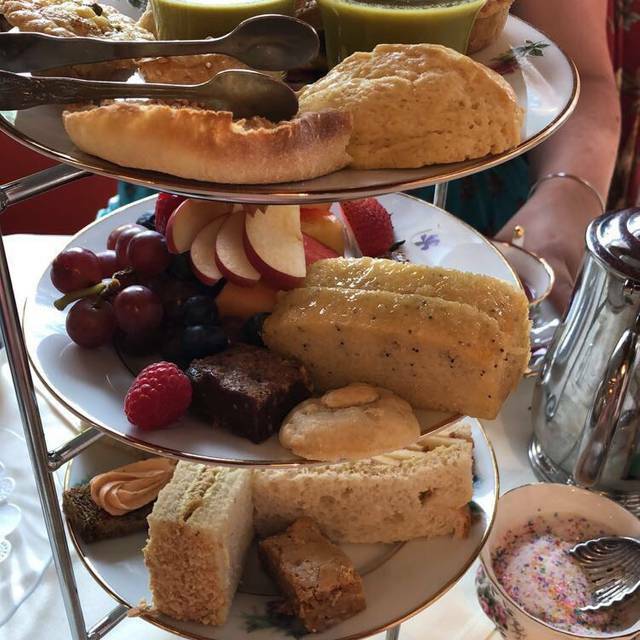 I took my daughter, 25 and her friend for high tea and it was delightful; Queen Mary herself even served us. I would highly recommend this for a special event or just a fun day outing. Thank you Queen Mary Tea Room for such a wonderful day. We will see you next time. Cheers! Delicious food, lovely setting and superior service. Thank you! Nice place for a ladies celebratory lunch. Desserts always look gorgeous. It's my go to tea room, love it. It's very cramped, but in someways makes it more precious. We loved the look of the restaurant, the tea was great and the food was hit or miss. The two most disappointing things were value and service- $22 for a kids tea that’s just pb&j, cake and fruit is just crazy. No, kids don’t need more food than that- but it should be priced accordingly. Same with the adult tea towers, other tea houses we’ve visited have done full size cups of soups and side salads with every afternoon tea- we were so disappointed to see our soup was just a shot glass! Our server was just fine but on our way out the door our 3 year old daughter was stopped by who I assume was an owner (older lady, long blonde hair moving things from her car to the restaurant) and she told my daughter she must have forgotten to leave her tiara at the restaurant. This was an honest mistake, it was her birthday and the server asked my daughter at the beginning of our reservation if she wanted a tiara for her birthday- we were shocked and she was overjoyed for what we thought was a gift. The server never mentioned it was just for while we were there. I thought initially that might be the case but the way the server phrased it and that they sold them in the shop left us all under the impression it was ours to take home. Needless to say, having a strange woman take your new tiara from you absolute devastated her. I would have been happy to have explained to my girl at the beginning of our meal that it wasn’t ours and were just borrowing it had I known. I know it was our mistake too, but having the servers say something like “while you’re here you’re a princess so you get to borrow our crown...” or something cute and creative as a way to clarify this would have been appreciated. Sadly now when she talks about her tea party yesterday she ends with “and then that lady took my crown away.” So, not even close to an ideal experience. Perfect food. Wonderful brunch/breakfast. love to take friends here for special occasions. It was fun and charming. But the service was notably unfriendly. Tea was lovely. The value for the experience was not there. The one thing that made this into 4 stars was the fact that our server was asking us to hurry and leave at 1pm (arrived at 11am tea/lunch schedule time for a party of 6) when I made the reservation online (QM website) it informed me of an hour and a half of time, for our reservation. I felt annoyed, we were there for my sisters bridal shower and I did not appreciate being asked to leave (barely there for an hour). Another note* The hostess did not acknowledge as we came in and I was standing there, in this small place, hovering her until she asked about our res. On a good note the food was amazing the high tea was an excellent way to try a lot of food. Our server was on top of keeping us taken care of, she did forget the wine my mother ordered and came around with it and said it was on the house. Overall we had an amazing time. We are looking into making this a yearly tradition for us and our kids! Would have been great except for waitresses with tattoos. Literally nothing could detract more from the kind of experience one is aiming for with a high class English Tea than chicks covered in tattoos looking like they just crawled out of the jungle. This is always such a special place to go. The staff is delightful and the food delicious. The food was great and the portions were big so it was easy to share and keep the price down. The tea was amazing and they gave us samples through out. Not a good trip for a very large group but perfect for a small party. As always, Queen Mary does not disappoint! We had an amazing afternoon celebrating my daughter’s 16th Birthday in a place I would frequent during my pregnancy with her. Having tea with my daughter has and always will be a special time. 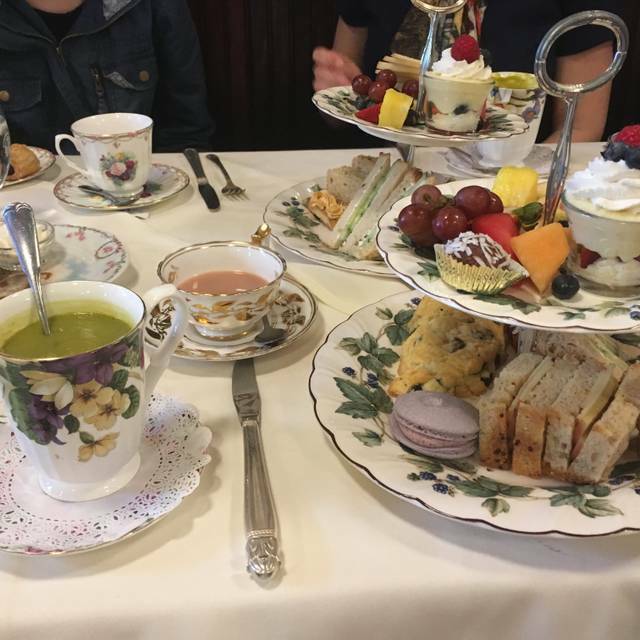 Queen Mary’s Tea Room is the perfect place to spend time together and create new, one of a kind memories. What a very fun experience! 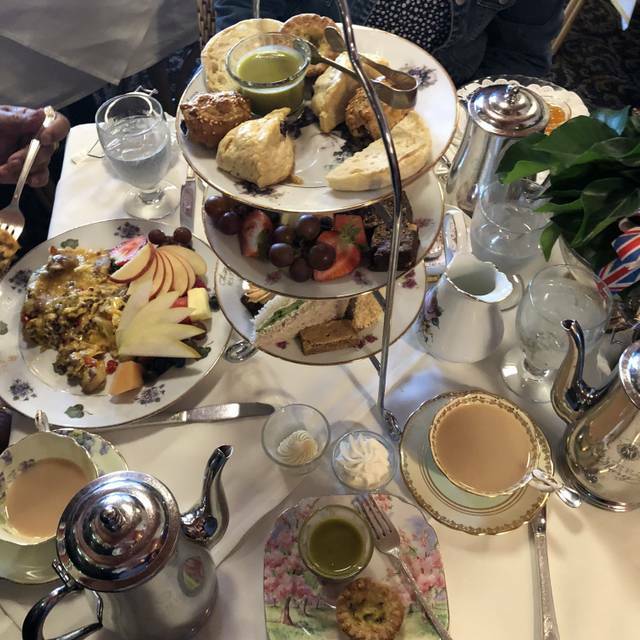 I was impressed by the great variety of teatime treats on the afternoon tea tower, the special touches like the shape of a bunny on the pot pie, the nice decorations and the excellent service, including free tea samples. Delightful experience. The most amazing tea. Very fun. Service from the first step in is awesome! The food was more than we expected and the experience really was great. We had a very lovely lunch/tea however our server was new and therefore not super helpful in tea selection knowledge. She was very sweet but definitely needs more training. As for the food it was really good as always although slightly expensive but you pay for the experience and it was a special treat. Delicious food and great service! Wonderful experience but food could be better for the price. This is a romantic and charming place to bring your loved ones to make them feel like a princess. It's British charm and outstanding food will make you there prince charming. Try the afternoon tea. Always a great brunch experience at The Queen Mary Tea room. Just a little tight quarters but it’s worth it. 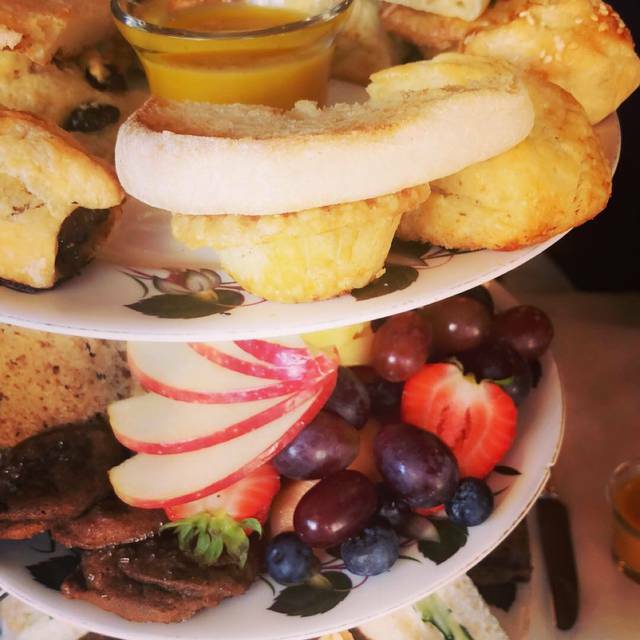 Wonderful place, delicious food, friendly staff and English tea room decor and ambiance. The only sort of downside is that while the space is a fine size, it's always packed (for good reason). But the noise level is not that bad even if every seat is full. Highly recommend. The manager was our waitperson and made us feel very welcome right away. Very chatty and friendly throughout our visit, not intrusive though. My Veg quiche was very good, but the green salad was lovely. We enjoyed a leisurely lunch for my birthday. I've recommended the QM before, but hadn't been back for some time. Glad we revisited. Delicious food! Tea selection is amazing! Been going here for years. Mary is a wonderful person and her place is the place to go for special events. Always a lovely afternoon tea experience. The staff is quick to respond and the food is delightful. The only thing is that it is a very small space and it can be quite loud. Not the most relaxing experience but a very fun social experience! Time stands still at Queen Mary’s. Definitely the cutes spot in Seattle. The restaurant is very small which makes being there very intimate for dates or just going out with friends or small parties. I also love the selection of teas they provide, as well as the food they prepare. 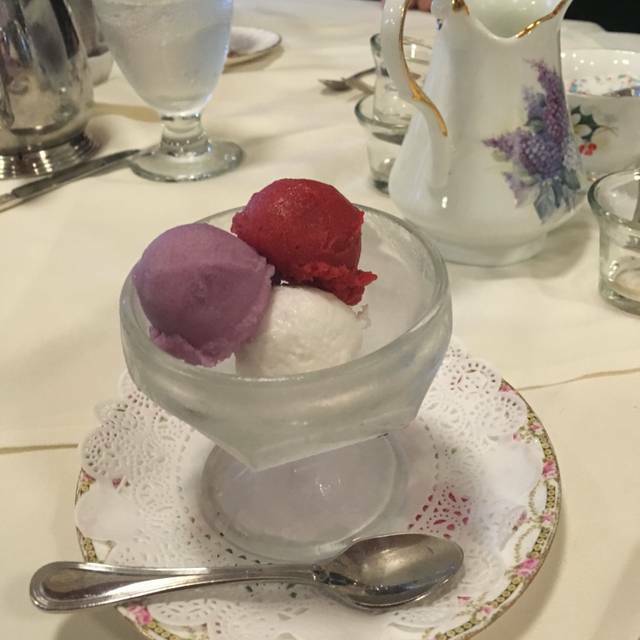 Queen Mary is our favorite teahouse on this side of the pond! The presentation and quality of morsels we were served was par excellence! Celebrated my mother-in-laws birthday and had a very special time. Definitely not something we do everyday. We had plenty of yummy food and even my three year old daughter enjoyed it enough to sit still. Fun, unusual, food is tasty and fresh. Huge selection of teas from everywhere in the world. Our first time having a tea party for my mom’s birthday was great! We enjoyed the food and the variety of teas that were chosen. We will be back again! Cozy friendly great afternoon tea. Amiable staff. Cute Victorian decorations. Delicious tea and food. Loved it. Lovely tea here on Saturday with my two granddaughters. They had the tea and I relished a wonderful dish of sticky toffee pudding with my tea. Lots of fun and a tradition for us when I visit Seattle! We were celebrating a birthday and she love her tea house experiences. The restaurants seemed smaller than expected from the photos online so it is cozy but quaint. The owner even came to make sure all was going well. Service was excellent, food was good. 3 of us had tea service, 2 upgraded to include champagne and 1 ordered a lunch item, just under $200 before tip. You definitely go to a place like this for the ambiance and charm and great attentive service. Street parking only and fortunately we found a spot just a couple blocks away so if you have someone that needs assistance, best to drop them out front and park. Birthday for my 23 year old niece. It was fabulous as always, but it’s been a few years and I was surprised how much the price has gone up. I’m retired on a fixed income now so it is hard.